Look at all that snow! It looks just like Toronto! Hopefully not for too much longer! This Hero Arts stamp arrived in the mail the other day and once I performed a little surgery on it*, it was good to go. I paired it with an old Stampabilities sentiment (also surgically altered). 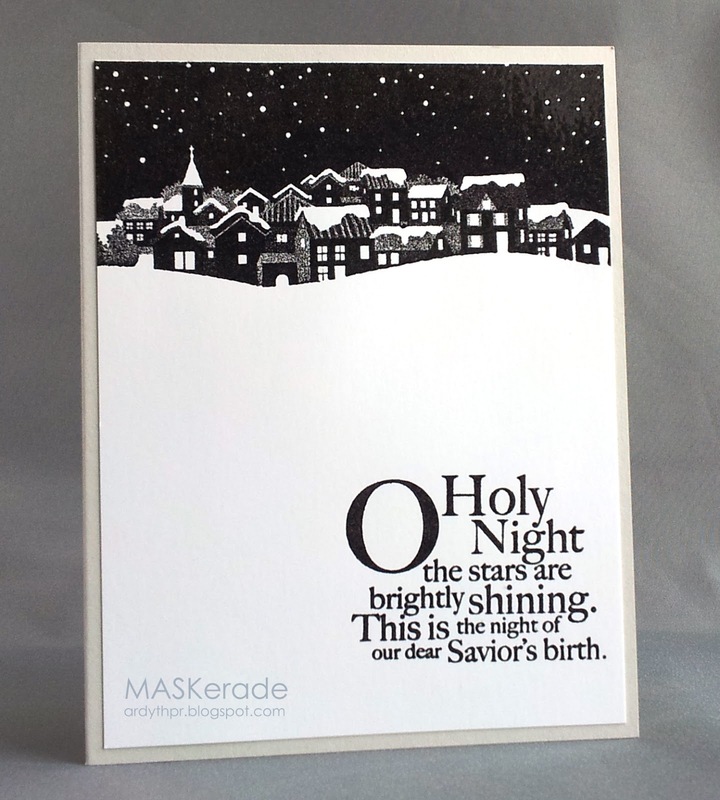 I cranked out 24 of these babies on Tuesday afternoon for my Church Christmas project, using a Soft Stone card base. These cards were an experiment in black. I started off using my new Memento Luxe black ink. It is extremely rich and black, but it is also slow-drying (like over night!) and (in my humble opinion) messy to work with. I have never loved pigment inks - I use Whisper White cardstock, which is a coated cardstock, and that means that the ink sits on top of it longer. If you use Papertrey or Neenah, which are uncoated cardstocks, I think that the drying time would be shorter since the ink will soak into the card stock more quickly. Anyway, I'm no expert, I just go with what I like. And for this card I ended up liking my Versafine Onyx, stamped and then embossed with clear ep. It is slightly less black than the Luxe, but then my fingers were also less black than when I used the Luxe. *stamp surgery on woodblock stamps is easy. You put your stamp in the microwave for 15 seconds and then it's easy to peel the stamp and foam away from the wood. Cut out the bits you don't want (mostly frames in these two instances) and if you're quick, the glue on the wood and the foam will still be warm enough to just stick them back together. Love that you performed some stamp surgery! Gorgeous card. Stunning Ardyth...the black is so crisp and clean that it looks like it was professionally printed! Whoa! 24 of these bad boys?! That's good going! This is so nice Ar. I think it worked out beautifully! You're a brave woman Dr. Ardyth....surgery on a brand new stamp...definitely something only a stamping warrior would try! This card is stunning! The B & W is PERFECT for this image. 24 cards in one afternoon - great start on the Christmas project. Regarding the Luxe ink - I use mine on CTMH card stock, which is my regular brand(a whiter white than SU and not as glossy). This card is beautiful, Ardyth! I love the simplicity of it for easy mailing but the impact of the black is perfect!!! Wow...what a beautiful and stunning card! Just gorgeous...you make me want to run out & get BOTH of those stamps! Glad to know I am not the only one who does stamp surgery, LOL! Gorgeous card - perfect in black and white. I use Versafine black. I don't have any Lux inks, but would love to try them. You're a brave person indeed to take a scalpel to a brand new stamp! The result is very effective, looks fabulous. Luxe sounds way too messy - I think I'll stick with Versafine! I never knew this technique of surgery :) so glad I got to learn this ;) beautiful card !! Such a gorgeous image! Good call on the clear ep - it gives it just the right amount of shine. And I'm with you on the VersaFine Onyx - nothing beats it in the black ink department! It's wonderful Ardyth, a real breathtaking design! This is stunning. Absolutely. It makes snow look beautiful and peaceful (isn't it always?) I was puzzled when I first saw your card because I have that stamp, and didn't see how you achieved that look--until I read about your courageous cutting. Mine is cling, so would be even easier to do--putting this one on my list. And, thanks for the tips about the types of paper. I just got a bunch of those Memento Luxe inks and am eager to try them this weekend.